Risk of Rain 2 is everything fans of the original game hoped it would be, so it's no surprise the sequel absolutely caught fire over the weekend. That said, even developer Hopoo Games wasn't prepared for the response: in a blog post, the studio said it was "absolutely floored" with the launch. In three days, Risk of Rain 2 has already garnered 6,500 (overwhelmingly positive) reviews on Steam, and according to Steam Charts, it's now handily in the top 20 most-played Steam games with an all-time peak player count of nearly 70,000. Hopoo's blog post also outlined its initial plans for updating and adding to Risk of Rain 2. 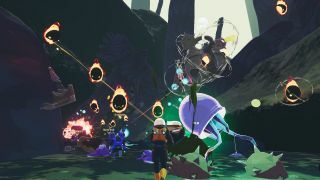 As previously reported, Risk of Rain 2 will get more characters, bosses, enemies, stages, and items during its roughly one-year stay in Steam Early Access. The studio says it's still working out how frequently performance patches will be released compared to content updates, but it did nail down some points it's actively working on. A patch scheduled to release today, April 1, should fix some bugs and performance issues, and more specific changes are on the way. Hopoo says it's actively working on changes to a few balance bugbears. The Imp Overlord and Magma Worm bosses can feel "a bit grindy," Hopoo said, so it's looking to rein them in a bit. These bosses could simply see their health reduced, but I reckon their behavior - teleporting all the time and flying to the freaking moon, respectively - could also be tweaked. On the other hand, Hopoo says one playable character, the hot-swapping robot MUL-T, is "a tad too strong," and will likely see a nerf of some sort. Perhaps most importantly - at least based on my experience playing the game with friends - the Teleporter used to advance to the next stage will be made more visible in a coming update. Depending on the level, it can be very easy to lose the Teleporter in the scenery, but Hopoo says it's working on a fix. "Hearing loud and clear about Teleporter being hard to see," Hopoo said. "Want to make it still an aspect of the game without it feeling like a mistake. Players are not really noticing the passive particles - will start with a soft approach first." The original Risk of Rain gave Teleporters a red highlight that helped them pop out. I imagine a similar, subtle visual cue would work here. Here are some of the other best PC games you can play right now.